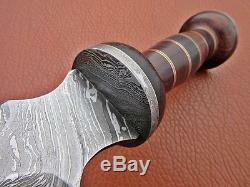 ROMAN GLADIUS 24 SWORD HANDMADE DAMASCUS HANDLE ROSE & PAKKA WOOD S-16736. Gorgeous Hand Forged Damascus Blade. Rose Wood & Pakkawood Handle. Extra Thick 5 mm Blade. This fabulous knife was designed and custom made by knife maker. 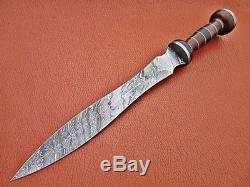 Marvelous Damascus blade of the knife is the result of hours and hours of forging. Not many custom makers can keep such pattern of layers upon layers flowing all the way to the edge of the blade, which creates a saw-blade effect at microscopic level, allowing the blade to keep cutting while other blades have dulled. Knife Maker Hand forged the blade of this knife with 1095 and 15N20. Blade was given excellent heat treatment and Rockwell hardness of the blade along its edge is 54 and along the spin is 42-45. 4 mm thick blade has fantastic hand grind. 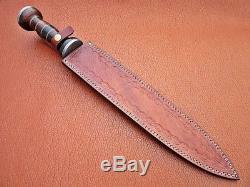 This knife is complete with a top quality extra thick leather sheath. The leather sheath is totally hand tooled and sewn. Extra thick leather and strong stitching make this sheath robust which can withstand years of rough and tough use. WE ARE USING DHL FIRST CLASS 2-3 DAYS. WE DON'T SELL KNIVES TO ANY ONE WHO IS UNDER AGE 18. IS ALSO NOT RESPONSIBLE FOR INJURY, DEATH OR CRIMINAL ACTS DUE TO THE MISUSE OF OUR PRODUCT. TAKE NOT RESPONSIBLE ON THIS ACCIDENT. [LIGHT BRIGHTNESS]: THERE ARE SLIGHT DIFFERENCE BETWEEN THE PICTURE AND THE REAL ITEM CAUSED BY LIGHT BRIGHTNESS. OUT OF SERVICE AREA, S CALLED (REMOTE AREA) IS CHARGED EXTRA CHARGES. 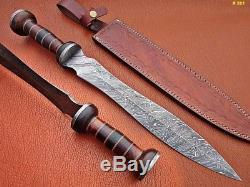 The item "ROMAN GLADIUS 24 SWORD HANDMADE DAMASCUS HANDLE ROSE & PAKKA WOOD S-16736" is in sale since Thursday, August 2, 2018. This item is in the category "Collectibles\Knives, Swords & Blades\Swords & Sabers\European & Mediterranean\Ancient History".knives" and is located in Wazirabad. This item can be shipped worldwide.